In an effective field theory approach to gravity, the Einstein-Hilbert action is supplemented by higher derivative terms. In the absence of matter, four derivative terms can be eliminated by a field redefinition. We use the Euclidean action to calculate analytically the corrections to thermodynamic quantities of the Kerr solution arising from terms with six or eight derivatives. The eight derivative terms make a non-negative correction to the entropy (at fixed mass and angular momentum) if their coefficients have appropriate signs. The correction from the six derivative terms does not have a definite sign. P.A. Cano and A. Ruipérez, Leading higher-derivative corrections to Kerr geometry, arXiv:1901.01315 [INSPIRE]. G. Goon, Heavy Fields and Gravity, JHEP 01 (2017) 045 [Erratum ibid. 1703 (2017) 161] [arXiv:1611.02705] [INSPIRE]. M. Lu and M.B. Wise, Black holes with a generalized gravitational action, Phys. Rev. D 47 (1993) R3095 [gr-qc/9301021] [INSPIRE]. A. Dobado and A.L. Maroto, Some consequences of the effective low-energy Lagrangian for gravity, Phys. Lett. B 316 (1993) 250 [Erratum ibid. B 321 (1994) 435] [hep-ph/9309221] [INSPIRE]. S.S. Gubser, I.R. Klebanov and A.A. Tseytlin, Coupling constant dependence in the thermodynamics of N = 4 supersymmetric Yang-Mills theory, Nucl. Phys. B 534 (1998) 202 [hep-th/9805156] [INSPIRE]. M.M. Caldarelli and D. Klemm, M theory and stringy corrections to Anti-de Sitter black holes and conformal field theories, Nucl. Phys. B 555 (1999) 157 [hep-th/9903078] [INSPIRE]. B. Bellazzini, C. Cheung and G.N. Remmen, Quantum Gravity Constraints from Unitarity and Analyticity, Phys. Rev. D 93 (2016) 064076 [arXiv:1509.00851] [INSPIRE]. G.W. Gibbons and S.W. Hawking, Action Integrals and Partition Functions in Quantum Gravity, Phys. Rev. D 15 (1977) 2752 [INSPIRE]. J.D. Brown and J.W. 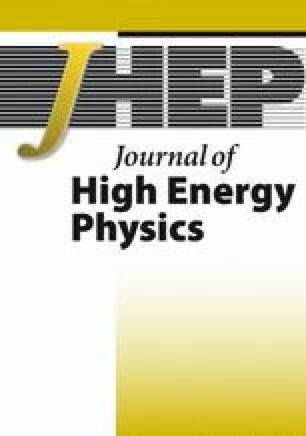 York, Jr., Quasilocal energy and conserved charges derived from the gravitational action, Phys. Rev. D 47 (1993) 1407 [gr-qc/9209012] [INSPIRE]. J.D. Brown, E.A. Martinez and J.W. York, Jr., Rotating black holes, complex geometry and thermodynamics, Annals N. Y. Acad. Sci. 631 (1991) 225 [INSPIRE]. J. Pawełczyk and S. Theisen, AdS 5 × S 5 black hole metric at O(α ′3), JHEP 09 (1998) 010 [hep-th/9808126] [INSPIRE]. R. Monteiro, M.J. Perry and J.E. Santos, Semiclassical instabilities of Kerr-AdS black holes, Phys. Rev. D 81 (2010) 024001 [arXiv:0905.2334] [INSPIRE]. S.N. Solodukhin, The Conical singularity and quantum corrections to entropy of black hole, Phys. Rev. D 51 (1995) 609 [hep-th/9407001] [INSPIRE]. S.N. Solodukhin, On ’Nongeometric’ contribution to the entropy of black hole due to quantum corrections, Phys. Rev. D 51 (1995) 618 [hep-th/9408068] [INSPIRE]. D.V. Fursaev, Temperature and entropy of a quantum black hole and conformal anomaly, Phys. Rev. D 51 (1995) 5352 [hep-th/9412161] [INSPIRE]. 1.Department of Applied Mathematics and Theoretical PhysicsUniversity of CambridgeCambridgeU.K.